Wolfgang Amadeus Mozart's Piano Concerto No. 20 in D minor K 466 was written in 1785. As was common with his concertos, it is three movements and scored for orchestra with the addition of the timpani which contributes greatly in creating the dark and brooding nature of this work. A few days after the first performance, the composer's father, Leopold, visiting in Vienna, wrote to his daughter Nannerl about her brother's recent success: [I heard] an excellent new piano concerto by Wolfgang, on which the copyist was still at work when we got there, and your brother didn't even have time to play through the rondo because he had to oversee the copying operation. 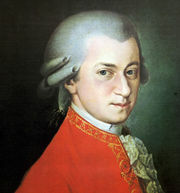 It is written in the key of D minor, which held great poignance for Mozart. Some of his most emotional works, such as the Requiem, a Kyrie and the dark opera Don Giovanni, are all in that key. The young Ludwig van Beethoven admired this concerto and kept it in his repertoire. He wrote a set of cadenzas for it that are used today. Another great German composer Johannes Brahms also wrote his own set of cadenzas although most pianists today also improvised these versions and developed interesting cadenzas of their own. The first movement starts off the concerto in the dark home key of D minor with the strings restlessly but quietly building up to a full forte. The theme was quickly taken up by the piano soloist and developed throughout the long movement. A slightly brighter mood does exist in the second theme but this theme never becomes jubilant. The timpani further heightens the tension in the coda before the cadenza. The movement rounds out on a quiet note, with the discontent seemingly not very far at hand. The romantic-sounding 'Romanze' second movement begins brightly with a strong B-flat major melody which is graceful and bold. A contrasting darker section toys with the minor key (G minor) although the earlier theme is brought in again expectantly towards the end of the movement. It is a seven-part Rondo (ABACABA). The final rondo movement begins with the solo piano rippling upward in the home key before the full orchestra replies with a furious section. (This piano "rippling" is known as the Mannheim Rocket and is a string of eighth notes (d-f-a-d-f) followed by a quarter note (a). A second melody is touched upon by the piano where the mood is still dark but strangely restless. A contrasting cheerful melody in F major ushers in not soon after, introduced by the orchestra before the solo piano rounds off the lively theme. A series of sharp piano chords snaps the bright melody and the beginning passages in D minor on solo piano is heard again, taken up by full orchestra and thereafter follows the same format as above, taking a momentary pause into introducing the customary cadenza. After the cadenza, the mood clears considerably and the bright happy melody is taken up this time by the winds. The solo piano repeats the theme before a full orchestral passage develops the passage and thereby rounding up the concerto with a jubilant D major finish. The tradition of the heavy brass and lower strings headbanging during the final movement of this began during a performance at the Royal Northern College of Music in Manchester in 1977 and has been preserved at every performance since.